Yesterday was the first day in the thirty-day challenge – living a life with no-regrets. If you missed the post, be sure to head back and check it out. Also, I asked yesterday what the five things in your life that you would change in you only had one month to live. If you haven’t already done so, I would love for you to share them on the comment section. Moving on, how many of you like roller coasters? I am not talking the ones in the kiddie section of the park. I mean the real roller coasters that push you back in the seat from the beginning and keep you screaming until you are back at the station. I, for one, love roller coasters – the faster and higher, the better. However, even I had limitations on what I will ride. Some roller coasters, like the Top Thrill Dragster at Cedar Point, are just too much for me. At amusement parks, we have the choice of which rides we will go on and which we will pass on. Life, however, does not offer the same kind of choices. Many times, we are on the ups and downs, twists and turns of life’s roller coaster and cannot get off. 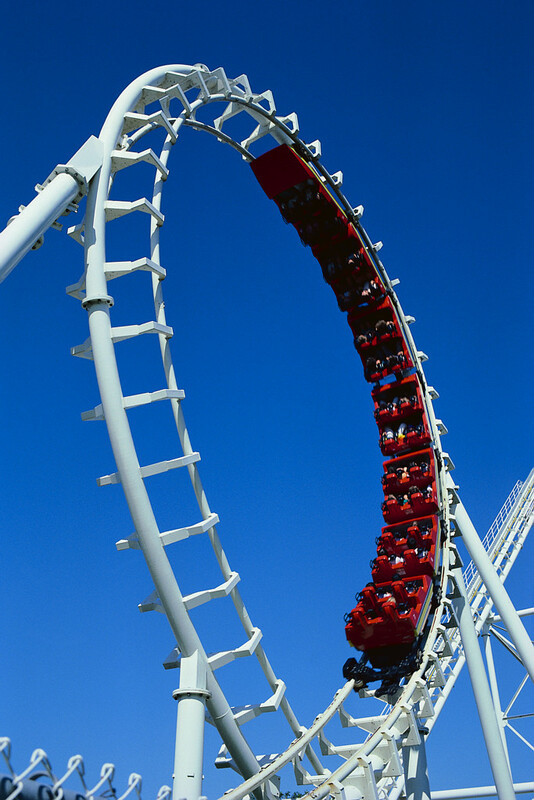 What about you: do you see life like a thrill ride or more like a merry-go-round? Do you play it safe or take risks? I truly hope that you are not one of the people that live in the Land of Someday: a person who keeps putting everything off until the timing, finances, etc. are perfect. Well, let me let you in on a little secret, it will never be perfect this side of heaven. You have to pack your bags on move out of Someday and live in Today. This is your life and it is happening now. I love how it is stated in the book, One Month to Live, “God did not design us simply to stand by and watch life pass as we wonder why we aren’t more fulfilled. God created us to take risks in faith and to conquer the giants that paralyze us with fear” (p.14). What are the giants in your life that you need to step out in faith and go against? David did this very thing in a literal way when he faced Goliath. Compared to God, David’s giant, just like the one in your life, will seem so such smaller. Think about your life for a moment, what are you doing right now that requires faith? If there isn’t anything, then why not? Are you living your life with God’s perspective or your own? God has so many wonderful things in store for each of us. However, in order to reach many of those things, we have to sit back and let Him lead. What ever twists and turns your ride may take, God is right there next to you through it all. Today, I would like to encourage you to take a risk and let God lead your life instead of fear. What is your biggest regret? Why? Do you have a particular area of your life that is stuck in the Land of Someday? Decide today that you will pack up and move that area into Today. The authors used the metaphor of a roller coaster to illustrate life. What symbol or metaphor would you pick? My metaphor or symbol is the Ocean. My life has been pretty steady or constant in the fact that I’ve worked for Indiana State University for 26 years. Each day I go to work and each evening I return home. Just like the ocean tides that go out and return back to shore on a regular schedule. The ocean is affected by the weather and that causes the tides to be calm or raging depending on whether or not there are storms. Likewise my mood tends to be high or low depending on the storms that I’m encountering at work or in my personal life. The tides are sometimes low and sometimes high, constantly in motion or changing. My moods are like the tides changing from high to low and affect those that are close to me, just like the tides effect the ones who are close to the shore. The Lord calms the sea/ocean and Christ is the only one who is able to calm the storm or moodiness in my life. I have to remember to not worry about the storms on the horizon but trust that God will take care of what is ahead. I love this symbol! It works on so many levels, just like you mentioned. The storms of life tend to affect me as well. However, I love your reminder that God calms the storms in our lives. We only need to trust Him. Thanks so much for sharing!